Assam Police changed 'Gully Boy' to 'Gullible Boy' in their post. Zoya Akhtar's Gully Boy opened to positive reviews this morning, but Gully Boy fever had taken over the Internet way before that. Soon after trailer for the Ranveer Singh and Alia Bhatt starrer was released, memes, jokes and rhymes inspired by it took over the Internet. On Wednesday, Assam Police too shared a Gully Boy-inspired rap on Twitter, and it is winning hearts on the microblogging website. The post, as with all their posts, comes with an important social message - this time on cyber security. 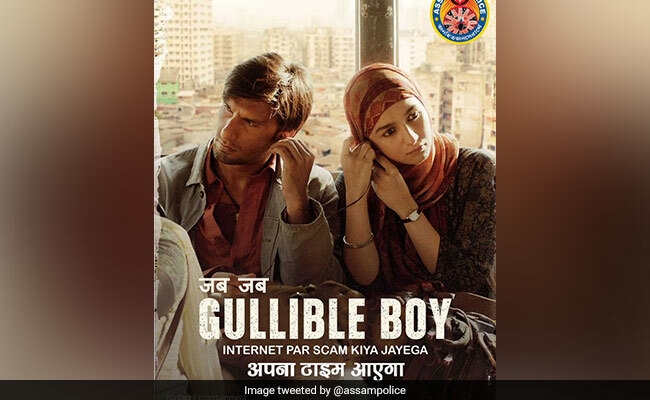 Assam Police, changing the words 'Gully Boy' on the movie's poster to 'Gullible Boy', shared a verse that warns netizens against online scammers. The lyrics of their rap-verse are inspired by the song Mere Gully Mein from the movie - and it has already won them a lot of fans. Wo ye maal hai pyaare. Ginti me jo ye sare beshumar hain na. Spreading Information in the most creative way! Police is here!!! This isn't the first time that Assam Police has creatively tweaked the lyrics of popular songs to share social messages. In November, they warned netizens against fake news with a Bohemian Rhapsody post that was widely appreciated. Before Assam Police, Mumbai Police also shared a Gully Boy post. They used a dialogue from the movie to raise awareness about traffic rules.